The event will be held from 7 to 9 pm at Beacon of Hope Recovery and Wellness Center, which is located at 21770 FDR Blvd. in Lexington Park. The event takes the thought-provoking subject of Recovery and turns the topic into a delicious, sweet event. Guest speakers will come to the event to talk about their own experiences in long-term recovery. After they speak, the S’mores Social will begin. 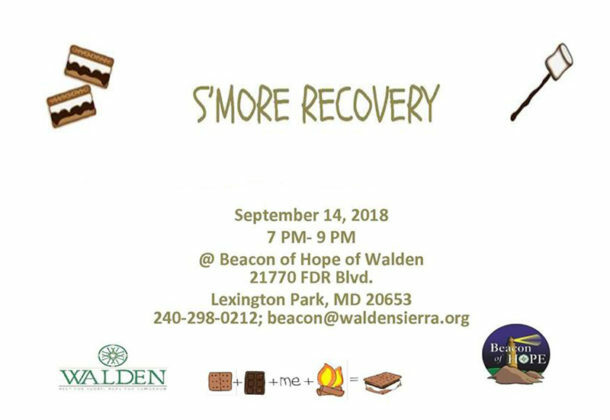 Guests and speakers will share S’mores, with marshmallows, chocolate, and graham crackers. The panel of speakers in long-term recovery will be able to answer any questions participants might have about living in recovery and finding peace, stability, and joy. Since 1973, Walden Behavioral Health has grown and evolved to meet the changing needs of individuals and families in all three Southern Maryland counties, while working hard to improve the overall health of this community. The event is free and open to the public. Check out the event’s Facebook page for up-to-date information as the event approaches. For more information about Walden Behavioral Health and its services, visit their Leader Member Page.